the Lord seeth fit to inflict upon him, even as a child doth submit to his father. ~ King Benjamin, 124 B.C.. Some people believe that anger is a normal and natural emotion, and should be expressed on occasion; this is the teaching of some therapists and counselors who encourage the release of anger as something that is healthy, . . . it's called catharsis: "Go ahead, get angry, . . . you'll feel better if you do." Some who propagate the practice of catharsis argue that anger is a "neutral" emotion, and as such, to express one's anger is not morally wrong. This erroneous idea comes from the fact that the heighten physiology associated with anger IS indeed neutral when "emotion" is defined in a particular way, as shown in the following graph (note "Physiological Response" within Body aspect of Whole Emotion). Truth is, an increase in heart rate and in respiration due to a release of adrenaline in the body is neither morally right or morally wrong, that is, when separated from the holistic context of angry emotions, that include Spirit, Mind, and Being. 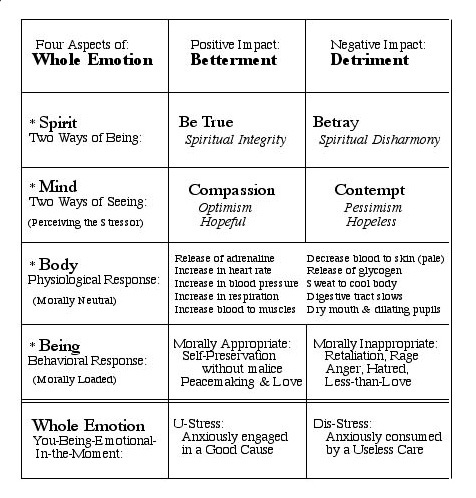 The following chart helps us correctly conceptualize "Four Aspects of Whole Emotion" (Changing Your Stripes, page 126). But bodily stirrings do not happen in a vacuum; physiological feelings never occur outside of the whole unified expression of body, mind, spirit, and action. Bodily stirrings are instigated in the first place by some interpretive perception of mind; and all perceptions are fundamentally determined by the spiritual integrity of the person doing the perceiving: The way we see the world is inseparable from the way we are being in the world -- whether we are being true or being false. Just as we do not see well in a dimly lit room, we also perceive poorly as we walk in spiritual darkness. When we see through darkened eyes, it is directly because we have failed to walk in Spiritual Light. "Cease from anger, and forsake wrath: fret not thyself in any wise to do evil." "Wrath is cruel, and anger is outrageous." "Let all bitterness, and wrath, and anger, and clamour, and evil speaking, be put away from you." "Be slow to wrath: For the wrath of man worketh not the righteousness of God." "Never suffer anger to arise in your bosom; for, if you do, you may be overcome by evil." "The moment a man or woman becomes angry, they show a great weakness." "Anger that leads a man … to condemn his brother is crime." You may be wondering, if anger is "a great weakness" and should be "put away," then why is "anger" attributed to God in the scriptures?" In some instances, this apparent contradiction is created by the defects of human language, where one word can have more than one meaning. To communicate with his children, Heavenly Father must necessarily speak using imperfect words: "Behold, I am God and have spoken it; these commandments are of me, and were given unto my servants in their weakness, after the manner of their language, that they might come to understanding." The word "anger" comes from the Old Norse word "angr" meaning . . . "affliction" or "sorrow." The words "anguish" and "angina" originate from the same root as "anger." Anguish = A very great physical pain; great suffering or distress. Angina = Any sudden, acute pain. ". . . and there was a man there which had a withered hand. And they watched him, whether he would heal him on the sabbath day; that they might accuse him. . . . And when he had looked round about on them with anger, being grieved for the hardness of their hearts, he saith unto the man, Stretch forth thine hand . . . and his hand was restored whole as the other" (Mark 3:1-5). It is commonly assumed that Jesus drove the money changers out of the temple in anger, but there is no mention of "anger" in that Biblical account (Matt. 21:12-13). Some people improperly project anger upon Jesus, because that's how an imperfect mortal would have behaved; and thus we tend to project our imperfect definitions of the word "anger" when used in reference to God, generally. with attempts to control others. Because God never judges unrighteously, His judgments are always perfect and He is never selfishly motivated, this means God's actions are ever-guided by love. God never engages in the exercise of control or compulsion upon His children; thus the word "anger" holds an entirely different meaning when the scriptures attribute "anger" to God, who is perfect in patience and compassion. It is improper to apply man's common meaning of "anger" to describe a God that is perfect in all positive virtues; in contrast, anger that expresses unrighteous judgment, selfishness, and attempts to control, this imperfect anger is clearly a betrayal of Truth. Burton Kelly concludes that "anger occurs as a result of sin," . . . "anger itself is a sin" . . . and "anger causes further sin." Because of pride and vanity, many people resist repenting of angry reactions. The more common response is to be self-excusing and accusing, with those providing the provocation being blamed: "If you hadn't have done that . . . then I wouldn't have gotten angry." We rationalize: "Anger is a natural and normal emotion, . . . anyone would have responded similarly." "Ye have heard that it was said by them of old time, thou shalt not kill, . . . I say unto you, that whosoever is angry with his brother without a cause shall be in danger of the judgment" (Matt. 5:21). In certain Bible translations the phrase "without a cause" doesn't appear, which suggests that there is no cause that justifies mortal anger that is judgmental, selfish, and controlling. Again, when the scriptures speak of God's anger, wrath, or fury, these words simply do not represent the same emotional reactions that flow from "natural man" (1 Corinthians 2:14; Mosiah 3:19). The original and obsolete meaning of "angr," as "sorrow," is an appropriate facet of Godly anger. Because God IS the Creator of heaven, earth, and all humanity, it is solely His prerogative to give and take life, and to apply "recompense" (Jeremiah 25:13-15) according to His perfect Justice and Judgments. It is improper to attribute to a perfect God . . . the imperfect expressions of mortal anger -- an emotional outburst that attempts to control, is selfish, and judges unrighteously. Psychology's general approach to anger is thus: Because anger is normal and natural, people can never completely rid themselves of it—all they can ever do is try to CONTROL it and COPE with it. Through the Atonement of Jesus Christ there is a complete cure for angry emotions. One no longer needs techniques to COPE with an unavoidable anger that is assumed to be "natural" for all humanity; instead, through Christ there is a perfect brightness of HOPE that "all bitterness, and wrath, and anger" can be "put away" from us. Because the Lord gives no commandment save He prepares a way to accomplish it (1 Nephi 3:7), we know that anger can be repented of, and eliminated from our lives. A parallel teaching is given in the Book of Mormon. Wherefore, a man being evil cannot do that which is good; neither will he give a good gift. For behold, a bitter fountain cannot bring forth good water; neither can a good fountain bring forth bitter water; wherefore, a man being a servant of the devil cannot follow Christ; and if he follow Christ he cannot be a servant of the devil. Doth a fountain send forth at the same place sweet water and bitter? Can the fig tree, my brethren, bear olive berries? either a vine, figs? so can no fountain both yield salt water and fresh." Anger is corrupt fruit that grows on evil trees. Because "all have sinned, and come short of the glory of God" (Romans 3:23), at one time or another, we have all given into angry emotions that are judgmental, selfish, or controlling. But the fruits of anger cannot grow, and neither can they flow, when we repent of our sins and are purified through Christ's precious blood. As it is written, evil fruit and bitter water "cannot" grow or flow, as we are "good." Through Christ we can become pure fountains from which freely flow the sweet water of loving emotions. Further, by Walking in the Spirit, the sweet fruits of the Spirit is our harvest: Love, Joy, Peace, Patience, Gentleness, Goodness, Faith, Meekness, Temperance (Galatians 5:22) -- Godly fruits that represent the very opposite of man's imperfect Anger. Read Matt's Easter Sunday Talk at Church: It covers the topic of Anger too, as well as what the scriptures teach about speaking Godly and Kind Words, and having Christ-Centered Thoughts. even as storms of contention swirl.